BELLEFONTE, Pa. — A former Pennsylvania prosecutor testified Tuesday he does not believe a man who reached a settlement with Penn State over a molestation claim is the same person seen by a witness being abused by Jerry Sandusky in a university football team shower. Joe McGettigan, a former prosecutor who is now a lawyer in private practice, took the stand as the final witness during three days of testimony in Sandusky's bid for dismissal of charges or a new trial. McGettigan said his opinion about the man who claims to be the person described as Victim 2 in court records is based on changes in the man's story, that he appears too old to be the boy in the shower and that he did not provide certain details to investigators until after the man who witnessed the attack had given his own story in open court. Sandusky's grounds for appeal include a claim that McGettigan lied when he said during closing argument that Victim 2 was known "to God but not to us." McGettigan said he did not believe the man's claim to be Victim 2 at the time of Sandusky's 2012 trial. "I did not then and I do not now," McGettigan said. Graduate assistant Mike McQueary has testified he saw Sandusky abusing a boy inside a team shower late on a Friday night in early 2001, and reported the matter to then-head coach Joe Paterno and other top administrators. Sandusky was convicted of 45 counts of abuse of 10 boys after eight of them testified against him — but not Victim 2. McGettigan said the man who settled with Penn State was born in 1987, so he would have been about 14 at the time, but McQueary described Victim 2 as being about 10. McGettigan said the man was unable to properly describe the location of the attack and drew a map of a locker room that was not accurate. The man denied to police in September 2011 that any abuse occurred and gave the same statement to an investigator working for Sandusky's lawyers. But after McQueary testified in a related preliminary hearing, he hired a lawyer and changed his story, claiming to have been sexually abused. Neither the man nor Penn State has disclosed the precise nature of his claim against the university or said how much he was paid to settle it. McGettigan said Sandusky, who attended all three days of the Post-Conviction Relief Act hearing, "could at any time have told any number of persons" the identity of Victim 2. "He declined to say so." Another former state prosecutor, Jonelle Eshbach, testified that her office set up a sting after a March 2011 story in The Patriot-News of Harrisburg disclosed details of the grand jury investigation that led to Sandusky's arrest about seven months later. She and her supervisor, Frank Fina, placed a fake notice within the prosecution agency's file about someone who had been subpoenaed and then watched to see if it would produce a story that would indicate a leak within the attorney general's office. She said no one took the bait. Fina, the third person to testify Tuesday, said his doubts about the man's claim to be Victim 2 were based in part on early questions about when the McQueary incident occurred. At first, it was publicly reported to be 2002, which the man confirmed. Later it was determined to have been 2001. "There was a possibility that (he) had conformed his testimony to Mr. McQueary's recollection of the date," Fina said. 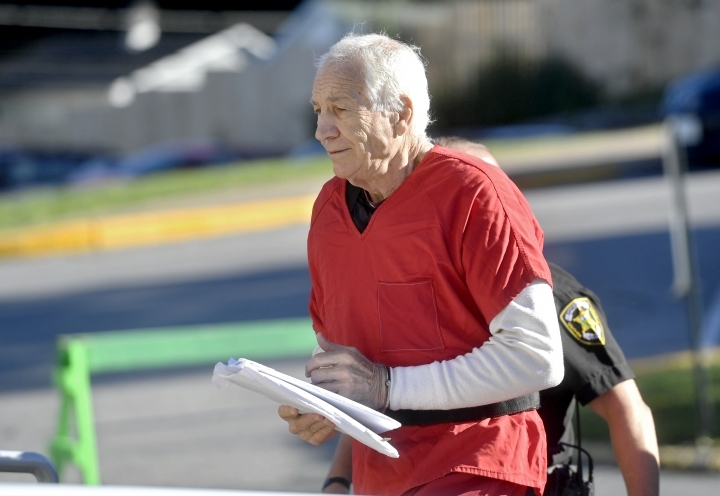 Sandusky previously lost direct appeals to the state's Supreme and Superior courts. The current process, presided over by the trial judge, is under the Post-Conviction Relief Act and therefore limited to newly discovered evidence, constitutional violations and ineffective lawyering. The judge did not say when he would rule but indicated there may be additional proceedings.